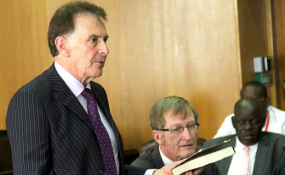 Nicholas van Hoogstraten takes an oath before Mines and Energy Parliamentary Portfolio Committee in Harare. Independent legislator for Norton, Temba Mliswa has threatened to resign as parliament's Mines committee chair after fellow MPs Monday blocked his attempts to have Hwange Colliery shareholder Nicholas van Hoogstraten appear before the committee. There was an exchange of words between opposition and ruling party MPs in front of foreign investors when Mliswa tried to have the United Kingdom based tycoon give oral evidence before the committee. Zanu PF MPs felt it was improper for the controversial businessman to appear before MPs when he had similar matters still to be decided by the country's courts. The incident led to a prolonged stand-off with Clerk of Parliament Kennedy Chokuda later called in to break the impasse. Mliswa failed to conceal his frustrations with his colleagues when he later spoke to the media over the matter. "I take full responsibility as chairman," he said of his attempts to grill someone whose matter was before the courts. "I erred and never wanted to lead troops into battle where they are killed. I did wrong and erred acting in such a manner. "I need to introspect and ask myself if I still want to continue as chairperson because certainly, I think it is not proper to make such a miscalculation as a chairperson. "I am intelligent enough; wise enough to have known that and I think I misfired and when you misfire, you have to be honest with yourself and my integrity and dignity is of paramount importance." Mliswa said he had a life outside parliament and had a duty "to keep it intact". "So I shall be consulting the powers that be and tell them of my intentions and in the next 48 hours, I should be able to inform the nation on my position pertaining to whether I should continue or not," he said. Mliswa also condemned the MPs' rowdy behaviour in front of the nation and the investors castigating those who are fighting for his post. "For me even if I am wrong, I still expect members of parliament to behave responsibly with dignity in front of people. That behaviour leaves the committee divided. "There are processes and procedures that can be followed. They should have rushed to the Clerk of Parliament for recourse. "There is a political will to finish the works that we started; I respect my dignity more than this chairmanship. "This committee is the main one in the country in terms of having progress in the production sector. It is not about being a chairman alone; there is need for unity as members." Mliswa said the matter was too political. "This position belongs to Zanu PF and I understand there are Zanu PF MPs interested in this position. What happened was so embarrassing to the nation and our investors," he said, adding that he had a feeling some corrupt Zanu PF MPs did not want to have their officials exposed by Hoogstraten. The Hwange Colliery Mine saga has seen government officials giving oral evidence on how the mine has reached bankruptcy levels and being put into reconstruction.